The Panasonic Lumix DMC-G6’s main competitor is the Sony NEX-6, which has a better sensor and a higher-resolution OLED viewfinder. However, the G6 enjoys a considerably wider range of compatible lenses that are like-for-like smaller and lighter, plus built-in flash, more controls and a more versatile touchscreen. Another camera of note is the Samsung NX20. Its viewfinder is inferior to the G6 and NEX-6, AF is not as impressive and its articulating screen is not touch sensitive. This is somewhat offset by its good-quality 20-million-pixel sensor compared to the 16-million-pixel units of others, and built-in GPS. 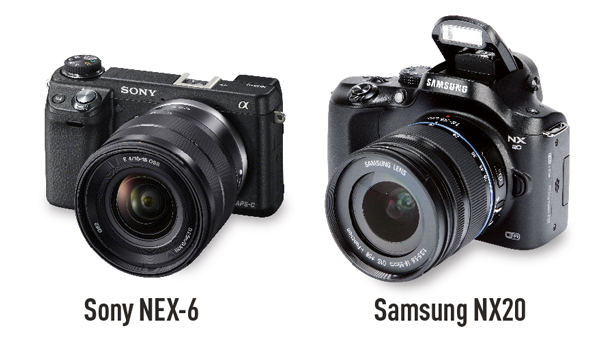 The NX20 started off more expensive than G6 and NEX-6, but is now being discounted.